They say if you use top quality olive oil, some fine tomatoes, fresh basil and garlic you can’t really make a hash of your passata. Well, technically you can (and this has probably happened at least a few times for most folks) but generally when working from points of success – it’s kinda hard to fail. Not that I’m equating Paul, George, Ringo and John with ingredients for your next ragout but the reality is that since they burst on the scene in 1962 the music of the Beatles is well, pretty near darn impeccable. Team up some of the world’s best actors and musicians (including a left-handed guitar player) who have passing resemblances to the four youngsters from Liverpool, unearth some Beatlemania footage including swooning girls from Shea Stadium, intersperse these with some flower-power tunes, trippy graphics and advertisements for highly carcinogenic stimulants, and you have a facsimile of one of the world’s best bands providing hit after hit after hit for almost two solid hours. There is little narrative (unless you include the visual and audio commentary which, aside from a passing reference to the Vietnam war, doesn’t make many allusions to the upheaval and politics of the times) and – unlike Jersey Boys orMamma Mia! – this tribute show is of the incessant jukebox variety with little room for character or personality. Though of course Lennon’s dig at the Royal Variety Performance audience (“If you’re in the cheaper seats, clap your hands. The rest of you can just rattle your jewellery”) is received with much delight. The company includes Neil Candelora, Tyson Kelly, JT Curtis, Chris McBurney (as Paul, John, George and Ringo respectively) and Daniel A Weiss (who makes the rest of the musical magic). Together they chart the rise to stardom for the four lads from Liverpool. 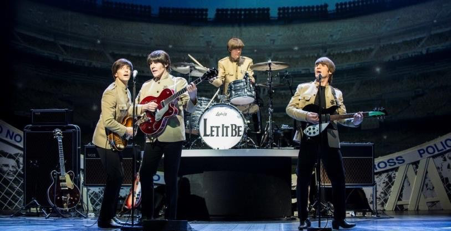 With some subtle (and occasionally not so subtle costume changes), Let it Be provides a chronological arc from Love Me Do onwards. Replete with crowd favourites including Norwegian Wood, All You Need Is Love (my mother’s), Daytripper, When My Guitar Gently Weeps (my father’s), Sgt. Pepper’s Lonely Hearts Club Band, A Hard Day’s Night, Yesterday (both) as well as the tunes I mostly remember in the eighties including Penny Lane, Strawberry Fields, Lucy in the Sky with Diamonds and Hey Jude,it is a set that is hard to fault. We collectively bemoan the absence of Help and Yellow Submarine but are reconciled by the fact that it is altogether an excellent a night of reminiscing and nostalgia. Transformative theatre? Probably not. Occasionally a slightly eerie feeling betwixt reality and illusion? Quite possibly. But as my parents (who grew up with this music first hand) proclaim as we leave the Civic, Let It Be is definitely a Twist and Shout down memory lane.